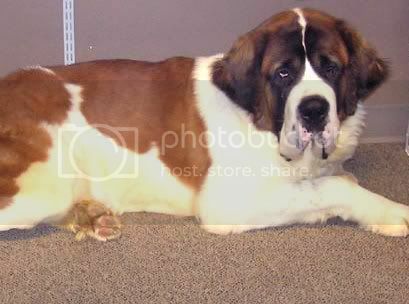 Hi All!, My name is Max and I am a Saint Bernard. I live with my mommy in Maine. Despite what you mighta heard, it does not snow here in the summer. A few of my favorite things are: playing outside, meeting new people, and chewing on new nike sneakers! Well, I will bark with ya later! Welcome Max !! I love Maine !! Hi and welcome! My best friend lives in Maine. Beautiful place! BTW.... Maine newbies send us lobsters !!!! Hello and welcome to you and your mom! I live in Maine too, great place. Hey Grammy, why don't you also ask use oldies for lobster? Hi Max and owner! I'm glad you joined us. Where abouts in Maine? Me and Giny are the local Mainiacs!! LOL !!!! Any lobsters are welcomed !!!! I went through the Lobster Hatchery at Bar Harbor .... fascinating !!! Especially the blue ones and the 1/2 & 1/2 ! Not too far from Dog Mountain which is great ! Sorry All, Mommy has been really busy, and so today was the first time she could post a photo of me!